Work with a partner. 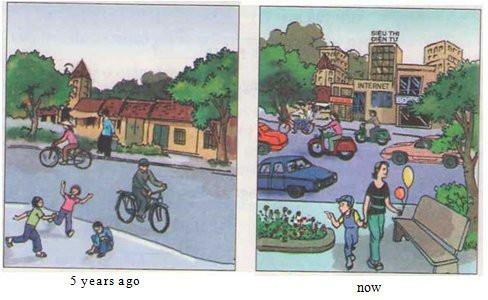 Look at the two pictures and talk about the changes of the town. The word prompts in the box may help you. 1. Work with a partner. Look at the two pictures and talk about the changes of the own. The word prompts in the box mav help you. Example : The town is becoming busier. 1. Hãy làm việc vói bạn em. Em hãy quan sát hai bức tranh và nói về những thay đối của thành phố này. Những từ gợi ý trong khung có thể giúp em. The town is becoming busier and noisier. The traffic is becoming busy. The buildings are becoming taller, more beautiful and modem. The streets are getting dirty. Things are getting more expensive. 2. W ork with a partner. Talk about changes in your hometown. 2. Em hãy cùng vói bạn em nói về những thay đổi ở thành phố quê hương em. Hue, my home town, has changed a lot in some recent years. The city is becoming busier and more modem. The traffic is becoming busy. The streets are getting newer and cleaner. The houses are becoming taller, more beautiful and comfortable. More schools, clinics, hotels and office buildings are being built and modernised. There are more playgrounds for children, and more entertainment and sports centers for all kinds of people. Almost every village has been electrified. Now, every house has electricity. Our life is becoming easier and easier.